Well, I got it. But if anyone was actually waiting for the review (which I doubt anyone was), I'm gonna have to let you down. I'll say this though, the picture quality is exellent (like you didn't already know), and no matter how much people will compare this to the Lord of the Rings EE sets, I think the documentaries are sufficient. I'm very pleased. I cannot wait for mine to arrive. Watching the great movies of my youth on crisp, beautiful widescreen is what DVD is all about, when you boil it down, for me. Sure, special features and commentaries rule, and now I've just because an addicted, DVD-collecting whore. But, I can remember the simple pleasure of marveling at the quality of the picture of the first DVD I bought and watched -- Jaws. Shame we've had to wait so long for that little Lucas space-opera trilogy. So who has 'em, and what do you think? Wow this place isn't terribly active. Great forums, though. Now, about two years later, I'll be the first to respond. The set is great, really one of my favorite DVD sets. The picture is beautiful. The films are preserved the way they were made. I hear there were a couple of tweaks, like erasing the obvious glass between Ford and the cobra, but no changes to the film or special effects. And the documentaries are awesome. Of course I'd have loved some commentary or even more along the lines of deleted scenes, but Spielberg has a thing about commentaries and these discs are so lovely that it's cool. um, thanks for the info. While fans of the "Indiana Jones" series honestly can't (or shouldn't) complain about the quality of the great "The Adventures of Indiana Jones" DVD release from 2003, committed film lovers can't be faulted for wanting every scrap of information they can possess from their favorite movies. As with practically any DVD release you could name, there's always that "what if?" quotient of bonus materials that failed to make a release. Deleted scenes, commentary tracks, vintage documentary footage, the list goes on. Sometimes studios withhold content due to space restrictions or an eye toward market demands versus production costs, and yet sometimes they withhold content for internal reasons altogether unpleasing to fans (think "double dip.") Whatever the case was in the instance of the "Indiana Jones" films is unclear, but "Indiana Jones" fansite Throw Me the Idol.com has evidence of a big, beautiful would've been, could've been that will make Indy fans angry with regret or ecstatic with future possibilities (depending on your demeanor, of course). 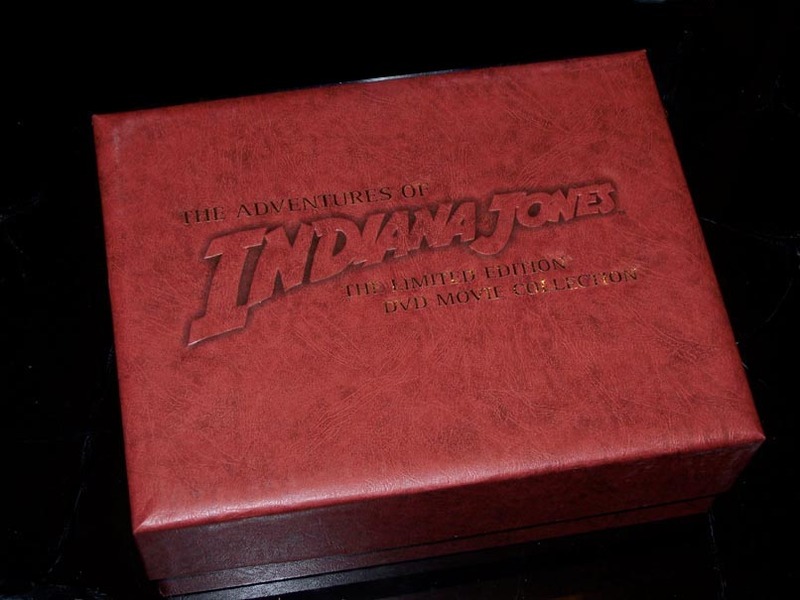 According to the site, Lucasfilm and Paramount briefly considered a real spare no expenses set for Indy fans, what was known in planning stages (from which it obviously never progressed) as "The Limited Edition DVD Collection." 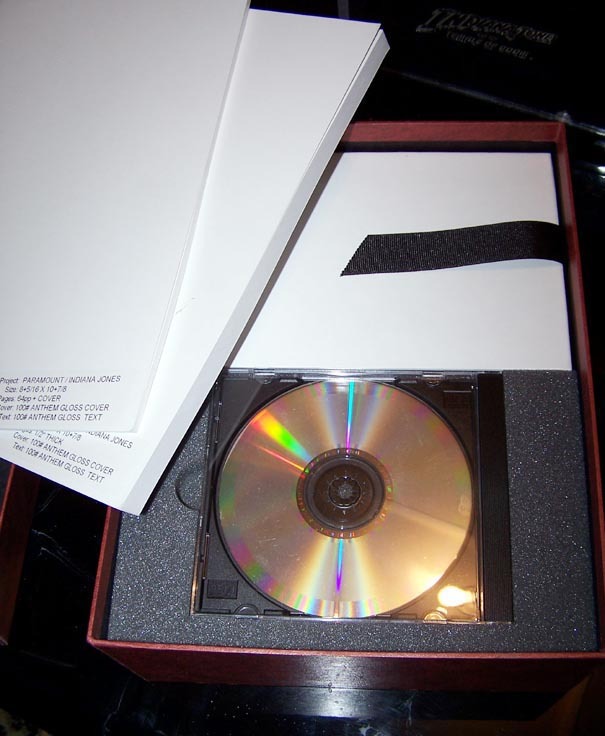 As evidenced through mockup photos and a report, the set was to include, "a large format tan box that contained two expansive trade paperback books about the making of the "Indiana Jones" trilogy... A music CD was to be included that contained the best of the John Williams scores." Whether or not the set would have included any further video content (deleted scenes, added documentaries — such as the great, vintage "The Making of Raiders of the Lost Ark" — is uncertain, but the idea that the studios planned on putting out something so enticing is at turns frustrating and fantastic! Here's hoping a future release of the "Indiana Jones" films on DVD or a high-definition format will see Lucasfilm really kicking out the stops for fans. There's certainly been a deficit of literature on "the other trilogy," not to mention a woeful gap on the market for complete releases of John Williams’ scores for the "Indiana Jones" films. And of course any fan should be clamoring for the complete, vintage "making-of" specials from all three films. Crack the whip...and your wallet! Grab your hats and ready your whips! Paramount Home Entertainment announced today that all three Indiana Jones films will be premiering as Special Edition DVDs – as well as included in a three-film box-set -- on May 13, 2007. Indiana Jones and the Raiders of the Lost Ark, Indiana Jones and the Temple of Doom and Indiana Jones and the Last Crusade Special Edition DVDs boast all-new, exclusive bonus features that dig deeper into the making of these cinematic milestones than ever before. All three were originally restored and remastered in 2003. Created with fans of all ages in mind, the bonus features provide never-before-seen explorations of the making of these classic movies and showcase the characters, action and extraordinary visual effects that have made the movies indelible cinematic treasures. Previously available only in a trilogy box set, the three films were restored and remastered to deliver an exceptional viewing experience to existing enthusiasts and a whole new generation of fans. All-new bonus content delves into the making of the legendary series as the filmmakers and cast look back and a new world of adventure opens up with Steven Spielberg, George Lucas and others offering hints about what to expect in the newest installment. Indiana Jones: An Appreciation—The cast and crew of Indiana Jones and the Kingdom of the Crystal Skull pay tribute to the original trilogy. Steven Spielberg and George Lucas commenting on the evolution of visual effects and CGI. i don't own any Indy on DVD. is this Adventure box set made up of these new special editions or is it the old box set? according to Amazon it seems the box set is still the 2003.
the dvdverdict seemed much more negative, as do the overwhelming negative amazon reviews. i think i'll wait for post Crystal Skull dvd time, if then. Next month, Lucasfilm will announce that they're converting the Indiana Jones Saga to 3D as well. The films will be converted and released in a similar fashion as the Star Wars films with Raiders of the Lost Ark the first out of the gate. There's no official word from Lucasfilm as yet, but with the bucks to be found in 3-D, we're willing to believe it'll happen, the only question being when. Paramount Home Media Distribution and Lucasfilm Ltd. announced Wednesday that The Complete Indiana Jones Blu-ray Collection will be released in the fall of 2012. Indiana Jones and the Kingdom of the Crystal Skull was released on Blu-ray following its theatrical release in 2008, so the announcement marks the first time that the original three films will make their debut in high definition. Paramount did not provide an official release date, but the press release indicated that the set would offer the films “using the highest possible high definition picture and audio presentation.” The 2003 box set included a feature-length documentary about the making of the first three films, as well as a collection of vintage featurettes “from the Lucasfilm Archives.” According to Wednesday’s announcement, the new set will be packaged with “a ‘best of’ collection of documentaries, interviews, featurettes and a few new surprises.” Without additional details, there’s no indication whether “best of” means a cultivated selection of previously-available bonus features or some new assembly of extras, but Lucasfilm’s multiple iterations of the Star Wars films on home video suggests that the set may not be truly comprehensive. Although director Steven Spielberg has declined to record audio commentaries for any of his films, fans would probably count that addition as the most welcome “surprise” should the studio convince him to record new audio tracks. But leave your comments below about which special features or extras you would like to see – whether they already exist or not – and perhaps Paramount and Lucasfilm can add them before the set is released this fall. "Raiders of the Lost Ark" was one of the biggest Hollywood hits of all time, and next month it will finally be projected on screens gigantic enough to suit it. It was announced on Tuesday that the first Indiana Jones adventure will have a limited one-week run on giant-sized IMAX theaters across the country starting on September 7. The picture and sound have been digitally re-mastered to look and sound better than they ever have before. The IMAX conversion process was so thorough, it even won over the toughest audience you could imagine: director Steven Spielberg. In a phone interview, the three-time Oscar winner told me he was "dubious" when he was first approached by the team at IMAX about bringing "Raiders" back. Spielberg said, "I didn't know if the 1981 print would stand up to a full IMAX transfer, so I came expecting a sort of grainy, muddy, and overly enlarged representation of the movie I had made  years ago. And I was blown away by the fact that it looked better than the movie I had made  years ago." Spielberg said he was particularly impressed how the IMAX conversion was able to make up for some of the limitations he faced when he originally shot the film over three decades ago. "All the shadows in the earlier scenes that we shot in Hawaii [were] always kind of muddy anyway on 35mm," Spielberg explained, "because we couldn't schlep all of our big arc lights down into this valley." The restored version of the opening scenes was quite a revelation for him. He said, "Suddenly, there was definition in the shadows, which I had never seen before. And the shadows weren't murky and washed out; they were sharp as a tack." Spielberg joked, "I sat there, I think, probably with my mouth open a little wider than it normally is." Spielberg commented that it wasn't just the image but also the sound that has been revitalized in this process. When the giant boulder comes rolling down after Indiana Jones, Spielberg said, "You'll see it full size, and you'll feel it in your stomach." He said that sound designer Ben Burtt didn't recreate any new effects, but was instead able restore the original elements to make them clearer and louder than ever. While in the past few years films like "The Lion King," "Titanic," and "Star Wars: Episode I" have found box-office success through 3D re-releases, Spielberg said he would never take "Raiders" into the third dimension. He said, "I wouldn't be interested in doing 'Raiders' in 3D because 'Raiders' is not really a modern movie. I don't see it popping out at me. I think the film is dynamic enough without having to lay on a 3D conversion process." He did note, though, that work is going on now for a 3D version of his "Jurassic Park" for that film's 20th anniversary next year. "That's the only movie of all of my films I have agreed to post-convert into 3D," he stated. Spielberg also made it clear that he would not be making any digital tweaks to "Raiders" to fix any problems or mistakes in the original movie. And he's well aware that expanding the image on the big IMAX screen will only make those goofs — like when Jones is facing down a cobra and you can see the snake's reflection in the safety glass that separates them — all the more apparent. But, he said, "I think that the fans are going to love that even more, because they're the ones that picked them out in the first place." When I asked Spielberg if there was any news about a fifth Indiana Jones film, he answered, "I'm up for it, but it's up to my partner, George [Lucas]. He's the big boss man of the stories. He comes up with the concept, and then we all work together on the scripts, but he hasn't presented me with a concept yet." Since Spielberg is not the kind of guy who usually has to take orders from someone else, I asked if he enjoyed the different dynamic that comes from working with Lucas. He said, "Well, that's been my relationship with George ever since I met George in 1967. [Laughs] He's always called the shots. So I'm accustomed to being a kind of a blue-collar guy for George's Indy ideas… I'm just waiting to see what he's going to come up with, if he even decides to do a movie." "Raiders" might not be the last Spielberg movie you'll get to see in IMAX. He said there were no plans currently to convert any of the other Indiana Jones films into the large format, but he did have a personal desire to bring another one of his films back: "I think the only other movie I would ever think about going out on an IMAX screen… would be 'Close Encounters of the Third Kind.' Forty percent of that film was shot in 70 millimeters, so the conversion would look extraordinary if we ever did put it up on an IMAX screen." Spielberg revealed he might also be considering IMAX for the next movie he has lined up to direct as well. He said, "I'm going to do an IMAX camera test, [both] a 2 and 3D test for my next movie 'Robopocalypse,' and I haven't decided whether I'm going to use the IMAX cameras, and I haven't decided whether it's going to be 2D or 3D yet, but I am in September going to start doing some tests." I posed the question to Steven Spielberg that if he could go back in time three decades to speak to his younger self what advice might he give. Spielberg responded, "The person who was shooting 'Raiders' at that time is still giving advice to the person who's making pictures today, not the other way around… He's telling me to do what you did back in 1981: 'Stop thinking. Less thought, more action.'" "We went on an adventure to make an adventure, and we were kids then," Spielberg recalled. "I think whenever I'm around the Indiana Jones series in any way… it makes me feel the way I felt in 1980 when I made the picture. For me, the movie is a little bit of a fountain of youth." "Raiders of the Lost Ark" will be on IMAX screens for one week starting on September 7. Then all four films in the series will be released for the first time on Blu-ray in the "Indiana Jones: The Complete Adventures" box set on September 18. And if that's not enough to satisfy your Jones for Indiana, AMC Theaters will be having a one-day marathon of all the movies back to back on September 15. Advance tickets are available at amctheatres.com/indianajones. Spielberg also made it clear that he would not be making any digital tweaks to "Raiders" to fix any problems or mistakes in the original movie.